Prenatal detection of intracardiac masses has increased in recent years with advancement in technology and expertise. We describe in this report an unusual cardiac defect which presented as an intracardiac mass during third-trimester obstetric imaging. A primigravida mother was referred at 28 weeks of gestation for fetal echocardiography following suspicion of a left atrial rhabdomyoma. Fetal echocardiography showed a single nonpedunculated mass located at the atrioventricular junction close to the primum atrial septum and the anterior leaflet of mitral valve [Figure 1]a. It measured 8 by 7 mm in size and had echogenic margins with central echolucency. Mitral valve looked normal and flow from left atrium to left ventricle was unobstructed [Supplementary Video 1]. The mass could be visualized adjacent to the aortic valve also, with the anterior tilt of the probe [Figure 1]b. Cardiac rhythm was normal, and no other mass could be seen within the fetal heart. Fetal growth was within normal limits and rest of fetal parts looked normal. We considered it to be a left atrial mass of uncertain origin as the echogenicity and location were not typical of rhabdomyoma, myxoma, or fibroma, the tumors seen commonly in fetal heart and family was counseled accordingly. Review at 32 weeks did not show an increase in the size of the mass or any additional mass within the heart and cardiac flow pattern remained normal. Postnatal follow-up details were available only after 9 months of delivery. It was a girl baby, born by normal vaginal mode, weighed 3.2 kg and had an uneventful postnatal period. Postnatal echocardiogram had reported a left atrial mass and child had been on medical follow-up as she remained asymptomatic. During her visit to our department, she was a well-grown infant with normal external features and development. There was no cyanosis, pulses were normal, a nonejection click was heard over the left sternal border, and there was no murmur audible. Chest X-ray showed normal cardiothoracic ratio and lung fields. Transthoracic echocardiography revealed an aneurysmal pouch located anteromedial to the anterior mitral leaflet, posterior to the aortic valve, and close to the interatrial septum and seen projecting into the left atrial cavity [Figure 2]a and [Figure 2]b. Wall of the aneurysm was redundant with flower-like projections. It was communicating with the left ventricular cavity through a narrow mouth of 3 mm in diameter, which could be demonstrated by color Doppler assessment [Figure 2]c. It was difficult to assess if the aneurysm was within the left atrial cavity or adjacent to it, but no evidence of communication to the left atrial cavity was noted [Supplementary Video 2]. Moreover, it was not obstructing the subaortic area. Both leaflets of the mitral valve and subvalvular apparatus looked normal. There was no other abnormality noted in the echocardiography and electrocardiogram showed normal rhythm. We revisited the fetal echocardiography video recordings, where blood flow from the left ventricle into the aneurysmal pouch could be appreciated in color Doppler in retrospect. The aneurysm seen in this case seems similar to the reported cases of pseudoaneurysm of mitral-aortic intervalvular fibrosa (MAIVF), mostly seen following infective endocarditis.,, MAIVF or aorto-mitral valvular curtain is the tissue located in the fibrous connection between the aortic valve cusp and anterior leaflet of mitral valve., As perforation of this tissue during surgery or trauma is known to cause the aneurysm, an inherent deficiency at this site may explain the congenital aneurysm formation. Chesler et al. in 1982 and Barranhas et al. in 2012 have illustrated a type of subvalvular ventricular aneurysm occurring at the MAIVF site., Location of the defect seen in our case seems similar to the above mentioned, but of congenital origin. So far, only two cases of congenital pseudoaneurysm at this site have been reported to the best of our knowledge. One in a 4-year-old child with Shone's anomaly and another in an adult., Our case seems to be the first isolated congenital aneurysm seen in infancy which mimicked a left atrial mass in prenatal imaging. 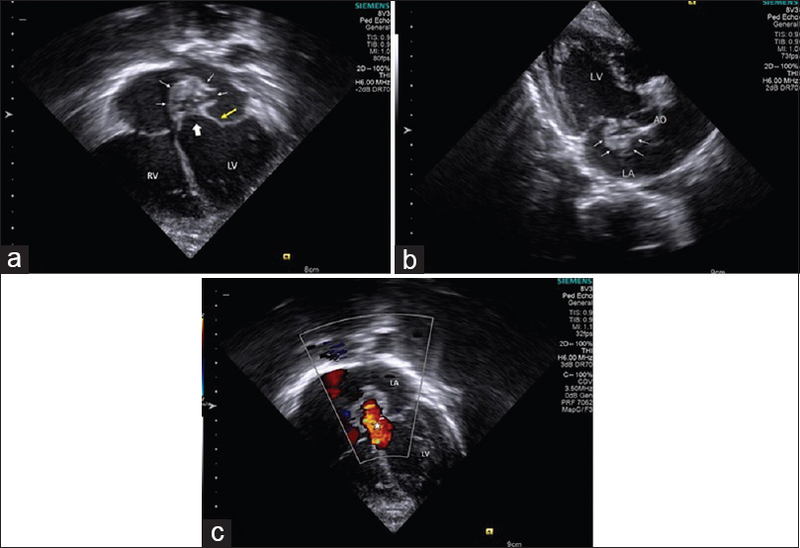 Unusual location and color flow into the mass during prenatal echocardiography were the findings in favor of an aneurysm which were overlooked during fetal imaging, probably due to the rarity. Despite a preplanned delivery and postnatal care in a tertiary level unit, the actual diagnosis got delayed, which reflects on the need for awareness about this entity and improved coordination between fetal and postnatal units. The characteristic systolic expansion and diastolic collapse of the aneurysm seen in echocardiography might help in differentiating it from a mass. Indication for surgical repair is not clear in asymptomatic cases. Our patient is on medical follow-up with endocarditis prophylaxis as it is a small aneurysm without any hemodynamic compromise. Need for intervention and timing may be decided in future based on further evolution. Complications such as rupture, coronary artery compression, aortic or mitral valve disease, and thromboembolism noted rarely in the acquired aneurysms have to be kept in mind during follow-up. We wish to acknowledge Dr. Raghavan Subramonian, for his inputs on this case. Sudhakar S, Sewani A, Agrawal M, Uretsky BF. Pseudoaneurysm of the mitral-aortic intervalvular fibrosa (MAIVF): A comprehensive review. J Am Soc Echocardiogr 2010;23:1009-18. Xie M, Li Y, Cheng TO, Wang X, Lu Q, He L, et al. Pseudoaneurysm of the mitral-aortic intervalvular fibrosa. Int J Cardiol 2013;166:2-7. Sahan E, Gül M, Sahan S, Sokmen E, Guray YA, Tufekçioglu O. Pseudoaneurysm of the mitral-aortic intervalvular fibrosa. A new comprehensive review. Herz 2015;40 Suppl 2:182-9. Gross L, Kugel MA. Topographic anatomy and histology of the valves in the human heart. Am J Pathol 1931;7:445-74. Anderson RH. Clinical anatomy of the aortic root. Heart 2000;84:670-3. Chesler E, Mitha AS, Edwards JE. Congenital aneurysms adjacent to the anuli of the aortic and/or mitral valves. Chest 1982;82:334-7. Barranhas AD, Dias MC, Dos Santos AA, Marchiori E, Nacif MS. Pseudoaneurysm of the mitral-aortic intervalvular fibrosa presenting after chest trauma and diagnosed by cardiac magnetic resonance: a case report. J Med Case Rep 2012;6:357. He D, Sinha P, Olivieri L, Jonas RA. Congenital aneurysm of the aortomitral intervalvular fibrosa. Ann Thorac Surg 2015;99:314-6. Garcon P, Lavie-Badie Y, Cador R, Bical O, Abbey-Toby A. An unreported congenital anomaly: Aneurysm of the lateral half of the mitral valve. Echocardiography 2015;32:1594-6.